Layers are best because, believe it or not, sometimes it can be very pleasant offshore--especially when the wind lays down. Far Below: I tell you, I promise -- we cannot restore fisheries productions from habitats we have yet to recognize even existed, let alone haven't yet restored. Only one trip since my last report. On seeing the first sea bass come over the rail that day, I advised (my very few) clients to only take fish an inch or more over the size limit. They limited in an hour & fifteen minutes or so. The crew & I, using jigs, took a bit longer. Yeah, no. I do not think fishing will be like that again anytime soon. I do expect a decent bite for upcoming trips. We were fishing a small piece of wreckage; perhaps something that rolled from a barge in heavy weather. 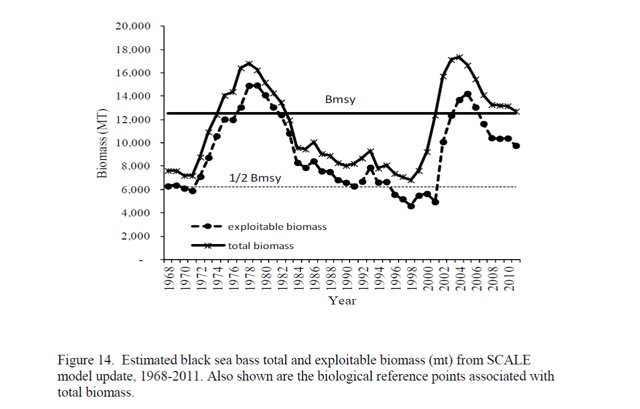 Such density, the amount of sea bass it takes to create true "Drop & Reel" fishing, is more frequent in early winter as shelf waters are evacuated owing to colder water. The deeper fish go, the more stable temperatures are. Compared to nearshore waters, in winter we have higher seafloor temps offshore. In summer offshore bottom temps would be comparatively cooler. Most of the fluctuation occurs nearshore. Indeed, tilefish, from Florida to even off the coast of Massachusetts and perhaps further north, are year round residents -- and active, I understand. This is because, having gone far offshore to the slope, the drop off where our canyons also lie, bottom temps remain consistent year-round. The only seasonal difference is daylight - and fishing pressure.. SOMETIMES SHOUTING, and sometimes in conversation, (but rarely silent,) I've been trying to get NOAA interested in sea floor habitat for almost 2 decades. Hey .guv! We need to understand seafloor habitat's role in fish populations. But, much more importantly to me; We must understand historical seafloor habitat's role in the far more vast fish populations from a half-century & more ago..
Below is my side, a condensed version, of a conversation that took place with researchers over a few weeks. Because scientific video work has recently shown traditional sea bass/lobster traps disrupting natural reef habitat, and because traps are a 'concern' right now in management, research funding might be more easily found for habitat impacts from traps. Dig in if you have a mind to. Pretty dense, but readable I hope. C) And methods of increasing spawning production. Probably post a tog trip in my next report. Tog open Jan 1st. Hopefully post a few more sea bass trips too before they close. .....................I believe it correct that traps can cause some habitat damage. It is so small, however.. This work could lead to new regulation--perhaps will. Yet I believe without some sense, a true feel, for habitat's history in the MAB, I doubt such research will lead to any meaningful fisheries restorations. Because MAFMC allowed anyone who had EVER landed a sea bass to get a "moratorium" permit in the late 1990s, the number of traps/pots probably more than quadrupled.. From my vantage as a recreational party boat skipper, it was frustrating to suddenly have to deal with so many more traps. Wrecks & reefs that had never had traps (in my experience) were suddenly loaded with rigs. Yet, in that exact period of incredible new effort from traditional traps, and owing instead to ultra-low trawl quotas in summer flounder, seafloor habitat grew in wonderfully over many natural bottoms. Nowadays traps are at a historic low off DelMarVa. I believe this is because IFQ allows transfer to winter trawl. We do have several areas where, right now & despite ongoing traditional trapping, epi-benthic eruptive sessile growths are increasing. That is, reef habitat is increasing despite no cessation of trapping. We also have an area where intense non-traditional trapping (drop pots) may be causing habitat loss ..but not much loss. A single pass -- one -- from a trawler undoes decades of growth in however broad an area the sweep covers. It used to be that a FLEET of trawlers (especially NC) would come into an area. Unless bottoms were too robust to tow--unless trawl operators were in fear of gear loss--bottoms were towed repeatedly before the fleet would move on. Even that, however, is as nothing when compared to the surfclam boom -- the period when Ocean City, and every other nearby port, had enormous fleets of surf clam/quahog boats. While it would take innumerable passes from a trawl to completely destroy even the least robust hardbottom substrates, (a peat-like/sandy clay-like hardbottom, easily broken apart by hand, of which we still have some) surf clam dredges liquify the substrate: now absolutely absent substrate, an area of reef can never regrow. It is my absolute belief this occurred in multi-square mile areas. It's pretty plain in fishing's history.. 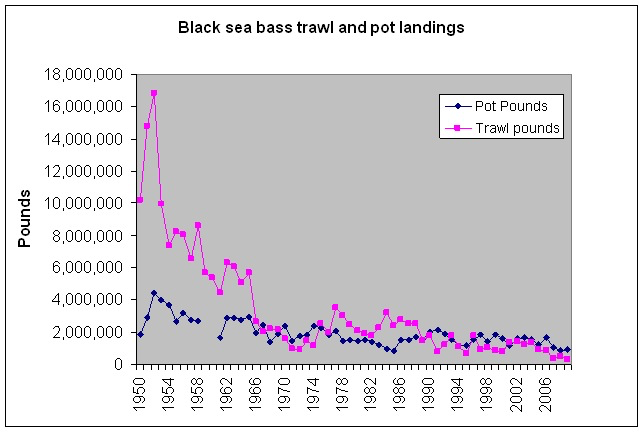 It remains true to this day: There were more sea bass landed and sold from 1950 to 1961 than in all the years since combined; and, because most of these cbass were landed by trawl, I believe that statistic, in and of itself, decries habitat loss more perfectly than any other. Restoration's need seems so perfectly obvious to me. Yet, so far, I've seen little interest in our hardbottoms's history. I suspect his email offers an honest look at funding you may not often see. I tell you, I promise -- we cannot restore fisheries productions from habitats we have yet to recognize even existed, let alone haven't yet restored. Perhaps we already understand from coral bleaching's perspective - maybe. But, decades lost, multi-square mile hardbottoms, long destroyed, that cannot be easily photographed for Facebook are nowhere factored into restoration efforts. I think almost everyone in management, very nearly to a person, believes catch restriction alone can restore any fishery. It is very much my belief instead that catch restriction is but one aspect of marine fisheries restorations. By embracing seafloor habitat improvement & restoration, we could make far greater progress. Seafloor habitat is unique in the restorationist's struggle, however, because first we must recognize it ever existed..
Not just sea bass; I've also heard from a trawl operator on cod ground. The story of busting through hard bottom, of blazing a trail for access----and then seeing the abject diminishment of fish in that area as others also begin to work it---is not unique to the MAB. If hard rock remains, reef-like production can be restored by allowing the rock to become recolonized with growth. In this instance "protection" becomes a beneficial management strategy. Where softer than rock, but nonetheless hard enough for colonization; where those bottoms are impacted to complete loss over many decades, (or all at once with our most industrious fishing gears such as a hydraulic clam dredge) - that's the point of no return. When the substrate's gone, no previous level of habitat production can be recreated w/o restoration or some manner of improvement. Protecting lost bottom is only a regulatory nuisance and not at all a workable management strategy. It's hardly a perfect graph. In the historic landings https://www.st.nmfs.noaa.gov/commercial-fisheries/ there are numerous methods of catch. 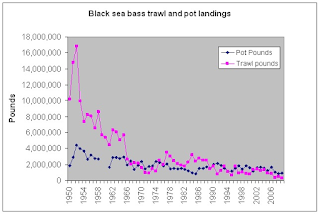 Still, were someone to truly bore down into it, I suspect the lines would remain very nearly as they are in this graph; but perhaps with a turn back up in recent times as more quota is used in winter trawl. I've done the math several times (that should not inspire too much confidence!) Calculating BSB catch decade by decade and year by year shows the period from 1950 to 1961 with a higher catch of cbass than all the years since combined. In the lower/central MAB it seems to take about 7 to 10 years for low substrates to recolonize nicely with the growths that turn rock into reef--natural substrates post impact will regrow in time. Everytime a substrate is re-trawled, however, the clock is reset. Assertion of regrowth is based on personal trawl impact observation & on artificial reef construction. Once a height of several feet is attained in Artificial Reef, growth occurs much faster. The sandblasted scour line, the lowest part of a manmade reef exposed to strong currents with suspended sediment always grows in slower. If at all. Quite nearly all the natural substrates along DelMarVa in the nearshore region are very low-lying. Sometimes only inches of a substrate are exposed. When grown-in, however, there can be substantial populations of fish on these low substrates even though they appear to offer no ledge/cave habitat. 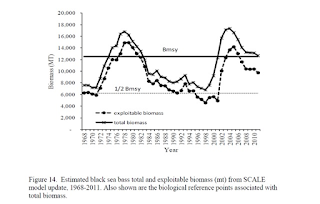 I think of habitat ignorance as a huge void in fisheries restorations. A void we're driving millions & millions of dollars through every year. The very simple K graph, (below) a representation of 'habitat capacity' that's similar everywhere in biology; that low-left & wavering high-right is what almost every fishery restoration looks like today -- any species' graph showing stock assessments from pre-management to present all appear to show, to me, a ceiling from which we cannot escape in ignorance. Once a species is at habitat capacity, management's efforts to create further population growth become draconian. Have. What must also interest the restorationist is where, say in the extreme example of striped bass, another species, (here weakfish or bluefish,) co-inhabit a spectrum of habitat along with the species under sharp focus (striped bass.) I haven't checked, but would think a seatrout/weakfish population graph far flatter than many other species. It appeared to me as though persistent dead zone occurrences were altering feeding patterns, but I may have been reading to much into it. To lift populations higher, and therefore quotas, we must understand today's tasks in habitat restoration & creation --- We Must Raise K.
From my perspective, it don't get much simpler than rolling rocks off a barge.